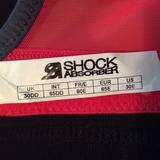 I have a watermelon red with grey trim colourway and the tag says S4490 which is the newer version of this model. B4490 is the older but it still floats around eBay too. My measurements are 26" and 34" leaning. Even to FOT, shallow, average width, close-set, tall roots. 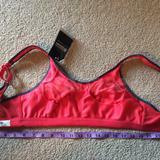 Usually wear 28E in lieu of easy-to-find 26Fs. So this is a 30DD. But this bra model is notorious for running very snug in the band. And I know that oddly some colourways run even smaller. And I used to own two B4490s in 28DD that were veryyyyy tight. So I chose to size up but I should not have. I bounce up top a little more than I'd prefer. Also the straps don't shorten as much as I need. I should have got a 28E or F. I wish it were an inch taller too for my really tall roots but I wish that about every bra.